Despite established recognition of the many critical environmental and social trade-offs associated with dams and reservoirs, global data sets describing their characteristics and geographical distribution have been largely incomplete. To address this shortcoming, the Global Water System Project (GWSP) initiated an international effort to collate the existing dam and reservoir data sets with the aim of providing a single, geographically explicit and reliable database for the scientific community: The Global Reservoir and Dam Database (GRanD). 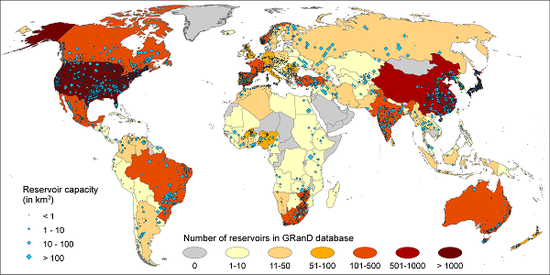 The Global Reservoir and Dam Database compiles reservoirs with a storage capacity of more than 0.1 km³. The recent version contains 6.862 spatially explicit records of reservoirs with their respected dams and gives information on their storage volume. Despite established recognition of the many critical environmental and social tradeoffs associated with dams and reservoirs, global data sets describing their characteristics and geographical distribution have been largely incomplete. To addrress this shortcoming, the Global Water System Project (GWSP) initiiated an international effort to collate the existing dam and reservoir data sets with the aim of providing a single, geographically explicit and reliable database for the scientific community: The Global Reservoir and Dam Database (GRanD). The development of GRanD primarily aimed at compiling the available reservoir and dam information; correcting it through extensive cross-validation, error checking, and identification of duplicate records, attribute conflicts, or mismatches; and completing missing information from new sources or statistical approaches. The dams were geospatially referenced and assigned to polygons depicting reservoir outlines at high spatial resolution. While the main focus was to include all reservoirs with a storage capacity of more than 0.1 km³, many smaller reservoirs were added if data were available. The current version 1.1 of GRanD contains 6,862 records of reservoirs and their associated dams, with a cumulative storage capacity of 6,197 km³. The development of the GRanD database has been coordinated by the Global Water System Project, Bonn, Germany, and has been executed in partnership and collaboration between members of the following institutes and organizations: Department of Geography, McGill University, Montreal, QC, Canada; The CUNY Environmental Cross-Roads Initiative, City University of New York, NY, USA; University of New Hampshire, Durham, NH, USA; University of Washington, Seattle, WA, USA; The Nature Conservancy, Arlington, VA, USA; Conservation Science Program, World Wildlife Fund, Washington, DC, USA; European Environment Agency, Copenhagen, Denmark; Food and Agriculture Organization, Rome, Italy; University of Yamanashi, Japan; University of Greifswald, Germany; University of Frankfurt, Germany; and Department of Ecology and Environmental Science, Umeå University, Sweden.